In the exclusive hills above the prime area of Bophut, you will find one of the island's best-kept secrets. Villa Suralai is a unique private villa retreat that once inside, guests find it incredibly hard to leave. In Bophut area, northern coast of Koh Samui, 10 minutes drive from the airport and to Chaweng Bophut Hills golf course and its 9 pitch and put course are just minutes away from the villa. Suralai is the home of the Angels in Thai mythology. Baan Suralai is located on top of the mountain above Bophut Fisherman’s Village. Suralai has spectacular sea views over Bophut Bay, Choengmon and Koh Phangan. Fast and convenient access to airport, Chaweng and Bophut restaurants and night life, shopping, amenities and health services. This stunning designer private residence features a fabulous main entertainment sala, six bedrooms, a 20m infinity pool, private life fitness gym and luxuriously appointed interiors and uninterrupted, breathtaking sea views framed by Choeng Mong peninsular and Koh Phangan. The imposing residence can be seen from the approach road below creating anticipation of the arrival. Entering the forecourt of the villa feels like being on top of the world. The Villa staff will greet you with an exotic tropical cocktail and a cooling towel while you take in the spectacular view from the main sala over Bophut Bay and over the sea to Koh Phang Ngan. The architect designed main sala has an impressive cathedral ceiling lined with tropical hardwood. The style is tropical modern and the 100 square metre expansive main pavilion is very stylish and comfortable. The Villa is surrounded by beautiful tropical gardens. The main pavilion over-looks the 20m pool and lawn and garden with the private pool sala on the east end of the pool. Each of the six luxuriously appointed bedrooms have their own private balcony or terrace, natural light to the expansive en suite bathrooms and separate walk in showers and feature bathtubs with sea view. The bedrooms are private sanctuaries with wireless internet, flat screen TV’s and entertainment systems and a safe. The two master bedrooms have dressing rooms one of which has a day bed that can sleep young children. The Life Fitness gym is located in a private area that opens onto the lower lawn and garden. Suralai is a hillside Villa in a garden, designed to provide private and practical accommodation suitable for large families or groups of friends. The flexibility of the villa also makes it an ideal choice for weddings and events. 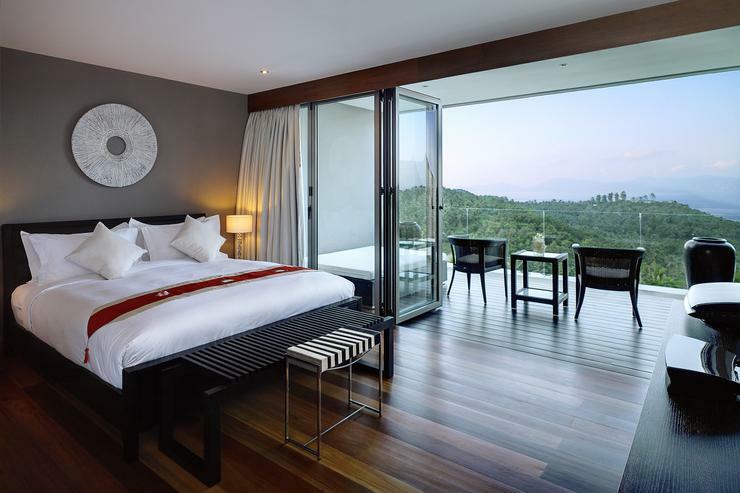 The hillside location makes it private, exclusive, with cooling breezes and low humidity and spectacular views over the silver green coconut palms and the whole of the north coast of Samui. King Size bed, Air-Conditioned, TV 30inch plasma screen TV, DVD player, ipod dock and surround sound system, in-room safe, private balcony, bathroom amenities and terrazzo bathtub and walk in shower with solar hot water. Twin Beds, plus single, Air-Conditioned, TV 30inch plasma screen TV, DVD player, ipod dock and surround sound system, in-room safe, private balcony, bathroom amenities and terrazzo bathtub and walk in shower. This is an ideal teenager room. To confirm a booking, we require a 50% deposit and the balance is due at least 30 days prior to arrival. Payment can be made by bank transfer. One-night security bond is required to secure the booking which can either be paid by cash on arrival at the villa (refundable) or credit card verification. 1. Intermediate Season and High Season: 30 days or more before arrival date: A cancellation fee equaling one-night stay will be levied. Deposit will be returned. Within 30 days of arrival date: All rental payments are forfeited. 2. Prime and Peak Season: For any cancellation after the deposit and/or balance payment, all payments are forfeited. The above cancellation charges also apply if Suralai cancels the booking due to non-payment of the balance. If the dates of the booking require to be changed or amended, this may be treated as a cancellation of the original booking and cancellation charges may apply. Special note: This page was about Suralai - Bophut beach, Koh Samui. All of our websites involve Holiday rentals in Asia. So please browse our holiday villa websites for more great deals and special offers.